Hailed as the next great reform, the Common Core State Standards are being implemented at breakneck speed in districts across the United States. 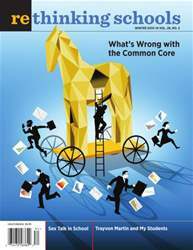 In this issue’s special section, we delve more deeply into the roots, problems, and trajectory of the Common Core. Note to our readers: Beginning with this issue, at least one of our articles will be available in Spanish as well as English.